The trains we have taken in Vietnam, Thailand and Malaysia have been surprisingly nice. Sets of facing seats and tables set up during the day make conversation, card playing, and eating meals easy. At night the seats are folded out into beds that are more comfortable than some of the beds we have slept on in guesthouses. So when we hopped on the 2 pm train in Butterworth, Malaysia, expecting to get to Bangkok, Thailand, at 11 am the next day, we were prepared for a pleasant experience. We had stocked up on our favorite travel day foods: Pringles and Oreos. And brought our new favorite condiment: kaya (coconut) jelly to spread on bread for breakfast. We had a few Malaysian ringgit left to buy dinner on the train and planned to get Thai baht at an atm at the border. The train left pretty much on time. We settled in, reading, playing cards, watching the scenery go by, and napping. 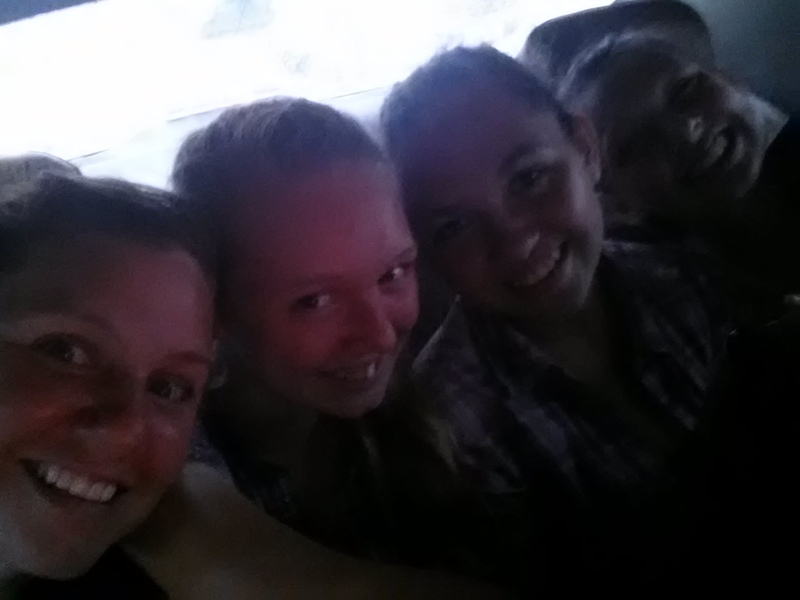 By 5 pm we were already at the Thai border. We got off the train to go through immigration. The line was slow but the process was simple. Unfortunately , we were only stamped in for 60 days instead of 90 to start our 6 months visa, so we would have to sort that out in Bangkok. There was no atm, but we had ordered breakfast sandwiches when we ordered dinner and figured with those and our snacks we’d be good until we got to Bangkok in the morning. Our dinner was served at 6 pm. Red curry and a chicken mushroom stir fry. Not bad for train food. 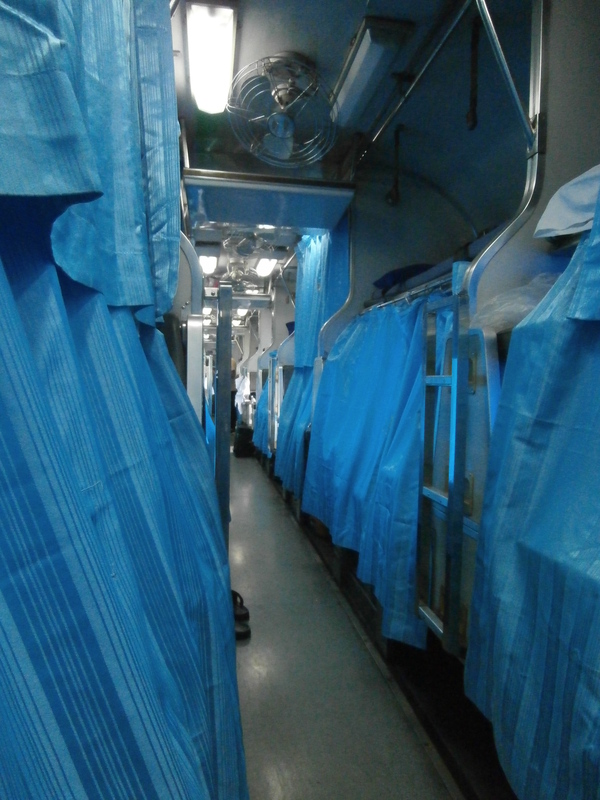 At 8 pm our seats were turned into beds with their own blue privacy curtains. 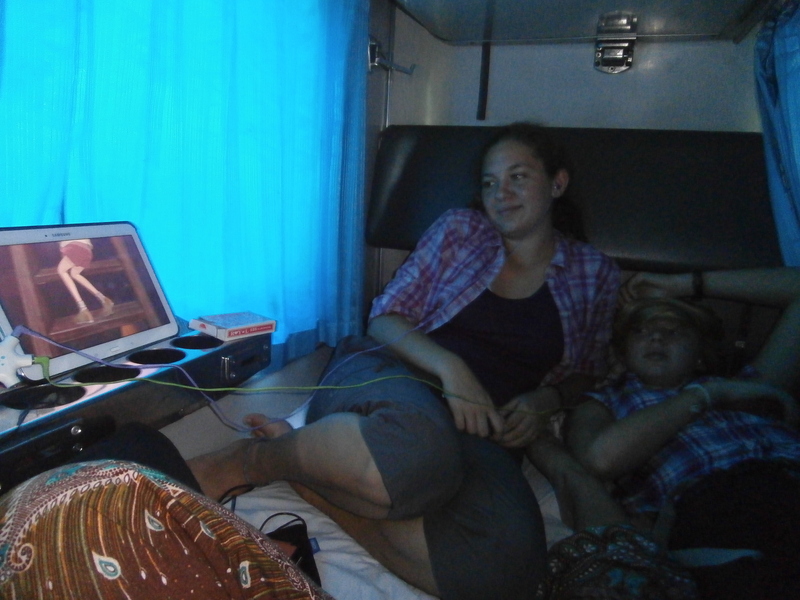 Sierra and Arwen climbed into my compartment and we watched Spirited Away on my tablet. 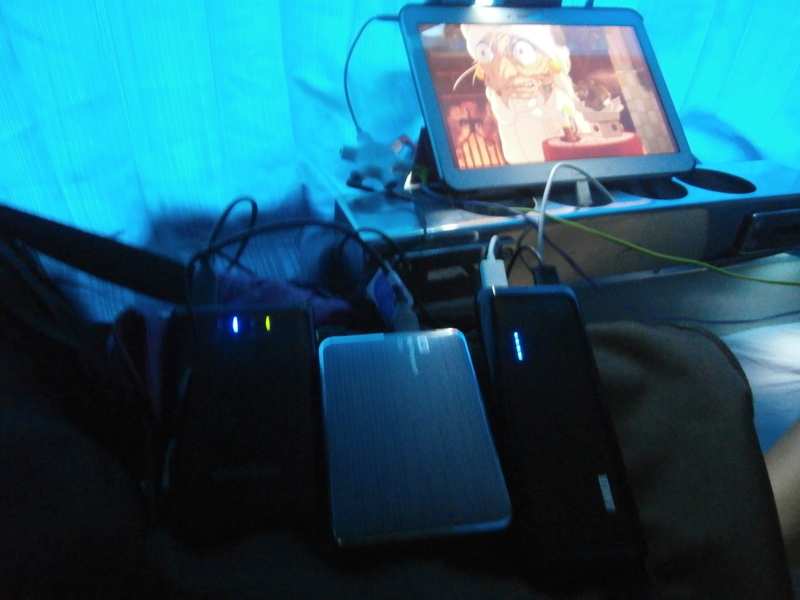 During our trip planning, we discovered a little piece of technology called a filehub that connects to your hard drive and broadcasts a signal, so that each of us can watch movies on our own seperate devices. Cool, huh? Around 10 pm, we turned in for the night. I love sleeping on trains. I feel so cozy in my little compartment, tucked in behind the blue curtain. And the motion of the train lulls me to sleep. It so happened that the train was stopped when I needed to go, so I waited. I read another chapter in my book and realized we were still stopped. After a half hour, I gave up being courteous and used the toilet while we were still in the station. Eventually the train got going again and it rocked me to sleep. I woke up when the rocking stopped sometime in the middle of the night. I look out the window, noticed we were at a train station, and fell back to sleep. Some time later I woke up again with the train stopped. Looking out the window, it was hard to tell if we were at the same station or a different one. Again, I fell back to sleep. When it was morning, we all just chilled in our bunks. Eventually, we got out our kaya toast and bread for breakfast. The breakfast sandwiches turned out to be tuna and egg salad. Gross. The train attendants kept asking us if we wanted to order breakfast. We insisted that we didn’t. We still had a pack of oreos and, since there was no atm at the border, we only had the equivalent of $3 in cash. Through a series of gestures and numbers we learned that the train was going to be late getting into Bangkok. But we couldn’t figure out if the train would arrive in Bangkok in 6 hours (at about 2pm since it was 8am at the time), be 6 hours late (arriving at 5pm), or arriving in Bangkok at 6pm. Either way we started rationing our food. At noon, we finished off the bread and kaya. One piece of bread and jelly each. At 3pm, we all got 2 Oreos. Our water was pretty much gone, but I did manage to get another small bottle of water with our remaining cash. I spent the day trying not to expend much energy so I wouldn’t get hungry. I read and slept. Luckily, our bunks were left down all day. The girls just stayed the their bunks doing their own thing, trying not to think about being hungry. We all avoided Rand who gets “hangry” when he doesn’t eat. Only Arwen gave in and ate one the the gross breakfast sandwiches. The rest were taken by a woman selling potatoes chips on the train. She sat down in the set of seats we had left empty when we all sat together on the other side of the train, picked up the bag of sandwiches I had left hanging on a hook, open the package, sniffed the sandwiches, tucked them into her basket, and walked away. ??? At 5:45 pm, 28 hours after we began what we thought would be a 21 hour train ride, we rolled slowly into Bangkok. Really, slowly. We could have walked into the city faster. Why can’t we just get there already? I thought. I looked out the window and saw shanty houses right next to the tracks. Little children played in the rocks just feet from the train. Older people sat in chairs talking. The train was going slowly for the safety of these people. I was hungry this one day, but how often were these people who could only afford tiny shacks practically on the train tracks hungry? I wondered. After seeing that, we all waited more patiently for the train to get to the station. Even when we were stuck in a hour long traffic jam with 4 of us crammed in the back seat of a taxi, we made the best of it. But we were definitely happy to hop out of the cab and see the street lined with food carts, welcoming us to Bangkok.